Ingla School of English is based in Turnpike Lane, an area within the borough of Haringey in north London. Our school is 1 minute’s walk from Turnpike Lane underground station, which is in Zone 3 on the Piccadilly Line. There are many bus stops close by and the buses served by these go to many destinations across north and central London. Click here for more information on local buses. We are an English language school created in 2010 by the staff of Wellington Study Centre, which had been established since 1989. 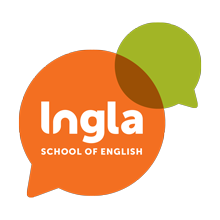 In July 2016 we started trading as Ingla School of English. Ingla School of English is accredited by the British Council. The British Council is an official organisation that monitors English language school in the UK. What this means is Ingla has met the standards required by the British Council's English in Britain Accreditation Scheme and is an indication that the quality of lessons offered by Ingla is very good. Please see the British Council web site for more information. What English courses do you have at Ingla? At Ingla we offer a range of courses – General English at 6 different levels (Beginner, Elementary (A1), Pre-Intermediate (A2), Intermediate (B1), Upper-Intermediate (B2), Advanced (C1)). In addition, we currently offer courses in English for Exams, English for Speaking, English for Nursing, Skills Clinics and One-to-One tuition. Which exams can I prepare for at Ingla? Many of our students attend preparation courses for Cambridge Exams like First (FCE) or Advanced (CAE). Another very popular choice is the IELTS exam, both general and academic modules. Obtaining the right score on the IELTS exam may grant you access to university courses in the UK and abroad. We also offer preparation for Trinity English language exams. Trinity qualifications are recognised internationally as reliable evidence of proficiency in English. Check our Exam Preparation Courses page. The maximum class size is 13 but the average class size is around 6 to 10 students. What if the level of the class is too low/too high? Students are placed in classes according to their result on a placement test and also the short conversation they have with a member of the academic team. In most cases, students are happy with the level of their class and they progress well. However, we understand that, on rare occasions, students may feel that the level of the class is too high or too low. In these case, we have clear systems involving conversations with the academic team which enable students to move classes. Every student receives a Course Completion Certificate at the end of their course which specifies the length of the course along with their level of English. Please complete the Online Registration form. You will normally receive a confirmation by email within 24 hours. If you are in London, it is easier to register in school so just pop in and we’ll start the registration process. How long in advance must I register? You may register at any time up to the actual day you want to start, although we cannot guarantee a place until you have paid a deposit. Do I have to pay for my whole course in advance? In most cases you can pay in instalments or in advance and receive a discount. This needs to be agreed by the Admin Team. Which day of the week can I start my course? At Ingla we have continuous enrolment which means that you can start your course on any day of the week, although we believe that it makes the most sense to start a course on a Monday. You can take one holiday during your booking, which you need to apply for by completing a Holiday Request Form at least 2 weeks in advance. Also at Ingla the school is generally closed for a week after each term. Do you have lessons on Bank Holidays (public holidays in the UK)? Like most other schools and services, Ingla is closed on Bank Holidays. Can I have a free trial lesson? How many students do you have at the school? Ingla has the potential of having about 120 students at the school during any school day. However, as Ingla is a young school, we are not always full so there is more than enough space for everyone to learn English in a comfortable environment. What is the average age of students at Ingla? Most of our students are between 20 to 35 years old, although we have taught students over the age of 70 before. What is the minimum age of students at Ingla? What nationality are the students at the school? We have students of almost every nationality. Most of the students are Spanish, Italian, French, Turkish. Bulgarian, Hungarian, Polish and Brazilian but we also have students from China, Russia, Japan, Germany, Mexico, Ecuador and other countries around the world. Can I study at Ingla as a non-EU / foreign student? You can apply for a Student Visitor visa and study with us for up to 11 months. Check our Student Visitor page. If you need a Visa to come to the UK, we will send you a confirmation letter for your course booking after receiving full payment. You can apply for a Visa then with this paper. Please remember that to obtain a student visa you must study a minimum of 15 hours per week and you must study at a school listed under the Accrediation UK scheme managed by the British Council – Ingla is listed. If you need an interview to obtain your visa please remember that it can take a long time to get an appointment at the embassy or consulate so it is a good idea to book your course early. In the case that your visa is refused, a refund is only payable on Ingla being shown original documentary evidence of a visa refusal. We will then refund fees paid minus bank charges and a £150 administration fee. Can I work while I'm studying in London? If you are an EU citizen and have a National Insurance number you can work in London without limitations. However, according to UK immigration law, non-EU citizens studying in the UK are not allowed to work in UK. Do your old student come back and recommend their friends to study with you? Our old students return year after year and a lot of our new students are friends of previous students. As part of the Ingla Enrichment programme, we offer learning and social trips to many places during the year. Once a term, we arrange a trip to somewhere outside London, such as Brighton or Bournemouth (which are two beautiful places to visit on the coast). In addition, we take students to cultural venues such as the British Museum, the Tate Modern and are looking to expand this programme to include theatres, musicals and some of the amazing pop-up events that happen regularly in our beautiful city. Is it possible to use the Internet at Ingla? Ingla is Wi-Fi friendly so you can access the Internet from your mobile device or laptop to not only stay in touch with your friends and family back home but also to visit websites related to learning English. How much money do I need per week for day-to-day expenses? This is difficult to answer, as so much depends on you! However, generally you will need at least £60 per week to cover your expenses for travelling, food and entertainment. And then there’s rent, which can add up to £120 onto your weekly expenses, so a lot depends on your choices and your lifestyle. But having said this, London is one of the most vibrant cities in the world with opportunities to do anything you want and, for this reason, many, many people come to London and end up staying here for a long time! Do you supply a student discount card? If you book a course for a minimum of 14 weeks full-time (i.e. fifteen hours per week) we can help you to apply for a 18+ Student Oyster photocard which gives you discounted travel within and around London. We offer accommodation for students at Ingla. Please check our Accommodation section on this website.